The premise for The Queen of Bright and Shiny Things at first sounded to me like your typical love story. Good girl meets bad boy. They fall in love. The end. Boy, was I wrong. The Queen of Bright and Shiny Things is a novel that takes readers beyond just romance. It delves into secrets kept by teenagers to maintain their lives and what happens when these secrets are in jeopardy. Beyond that, we’re also given a story about an unlikely pair falling in love when everything else around them has fallen apart. Sage Czinski is known around her school for her usage of post-it notes. Whether it’s to leave herself reminders or to leave reminders for her peers of their positives, the post-its have defined her since she started high school. A member of the school’s eco-group and an expert at keeping people from asking her theright wrong questions, Sage has done well at keeping everything at bay from looking too closely at her. All that changes when Shane Cavendish appears at her high school. The new boy, Shane, is everything that Sage isn’t but he’s also incredibly irresistible. From his grunge-but-not attire to his indifferent attitude to his perfect face, everything about Shane entrances her. And slowly, as the two begin to grow closer together, Sage learns just who Shane is beneath the surface and discovers that like all other teens, everyone has their secrets. Throughout The Queen of Bright and Shiny Things we are left wondering who Shane’s character is and how Sage’s character might develop him. There are so many differences and similarities between the two. I’ll admit, come the beginning of the novel, I was hesitant towards their relationship as it does develop at an insanely fast rate—but once they fall in love the novel is nothing but cute. The interactions between Shane and Sage are heartfelt and emotional. The two of them discover what it means to have another person who cares for you in this world, and to find somebody willing to share your world with them. I think a lot of readers will enjoy Sage’s character in that she isn’t your typical perfect teenage protagonist. She isn’t the popular girl. She isn’t beloved by all. Sage is a character who sweeps her way along, moving along with the crowd. Constantly remaining observant and containing her secrets and past. Sage’s love for the environment was refreshing and her attitudes and personality are something that many young female readers will be able to relate to. Not to mention her evolving crush on Shane holds many familiar scenarios that are faced in high school on the daily. What I enjoyed most about The Queen of Bright and Shiny Things was the amount of secrets woven into the plot. Secrecy and rumors play a huge role in the story. First with Sage’s group of friends, ex-friends, and with Shane. There are always disturbances in the plot to keep things interesting and the major plot twist nearing the end of the novel involving Sage and Shane had me shocked. 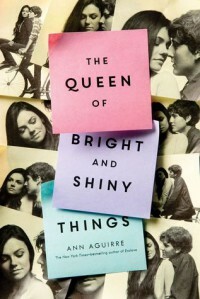 Readers who are fans of teen drama set in a high school setting will eat The Queen of Bright and Shiny Things right up. Aguire’s writing is clear and concise, giving readers an exact idea of what is going on in the plot and how Sage feels about it. We see her views towards Shane and the storyline on an emotional level and are never left wondering her opinion or thoughts. Moreover, Aguire’s writing is fast-paced and incredibly realistic at times. I would recommend The Queen of Bright and Shiny Things to readers who are fans of contemporary novels. Readers who are looking for a love story that isn’t slow-burn and readers who are looking for a story that will keep them on their toes are sure to devour this read.